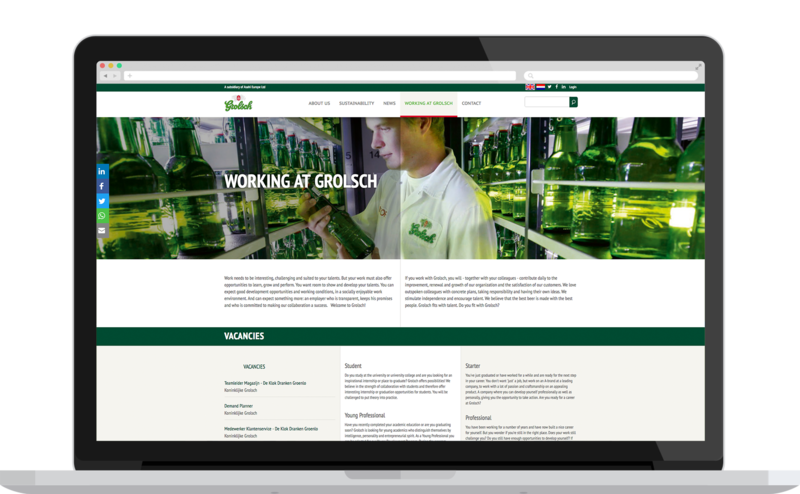 Formulate have worked with Grolsch for many years now on their corporate website, building it up from a fairly basic Drupal content site, to a platform which reflects Grolsch’s brand and serves its users needs with ease. Working with the Grolsch HR and Marketing teams, Formulate have created a modern corporate website that works in English and in Dutch. Following further updates in 2017, the site firstly acts as a great reflection of Grolsch’s core values, with areas dedicated to understanding their efforts in sustainability and responsibility, and a timeline which allows users to learn more about the brand’s rich heritage. Adding to this, the website also allows individuals to apply to receive funds for initiatives that align with Grolsch’s values, by promoting economic growth and social cohesiveness in the local region. For Grolsch staff members and any press contacts looking to represent the brand, there’s a ‘Press Room’ which allows users to download key brand assets, imagery and logos. And, for those who are hoping to become Grolsch staff members, vacancies are displayed using an integration with Grolsch’s HR software - Qandidate. Their beer portfolio is displayed in an interactive carousel, allowing users to engage with each offering and find further help on nutritional information and more, and a regularly updated news room gives users a reason to keep coming back.